I am thrilled to be able to join the INblue Fabric Tour, featuring the new line for Art Gallery Fabrics, designed by Katarina Roccella. Blog Disclosure: This blog post was sponsored by Art Gallery Fabrics. All opinions are my own. Make sure to scroll all the way to end for the tour schedule and a rafflecopter giveaway!! When I was asked to be a part of this fabric tour, I certainly didn't have to spend any time considering it. I mean with a line named INblue!? Of course I was in!! There were many cute prints to consider, but ultimately I went with my heart (ie. 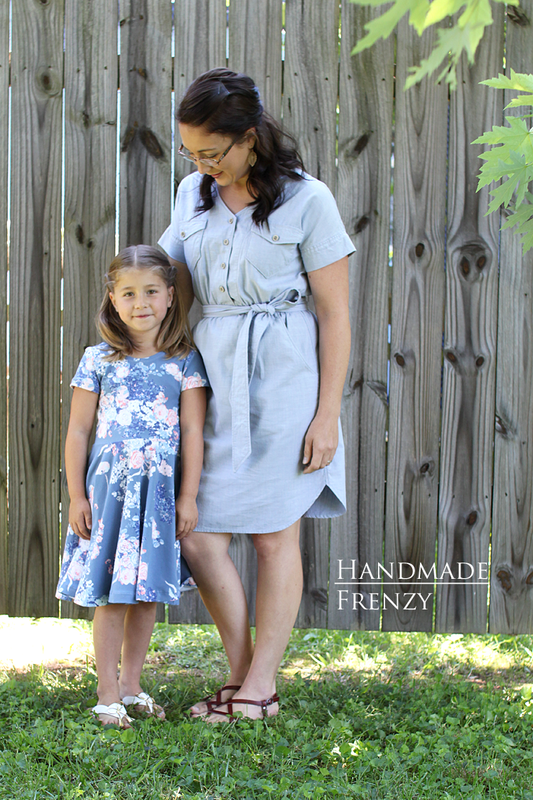 florals, solids, stripes, dots), and chose THIS lightweight denim for my dress. And of course I had to choose some of the yummy, delicious, AGF knit (THIS Bloesem Dark) for my girl. When considering Art Gallery Fabrics, one always knows that whatever the substrate, it will be quality! 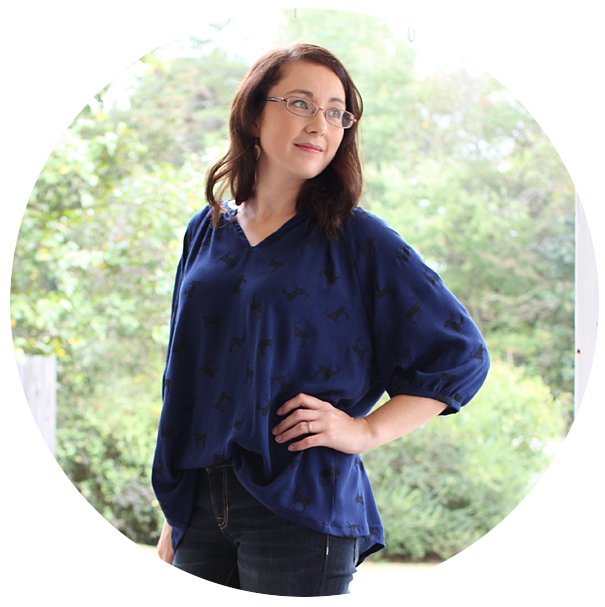 I had never worked with AGF denim before, but I certainly was not disappointed!! This fabric washed up beautifully in the prewash, and was minimally wrinkled, even out of the dryer. I did not notice any significant shrinkage. It was a dream to cut and sew. 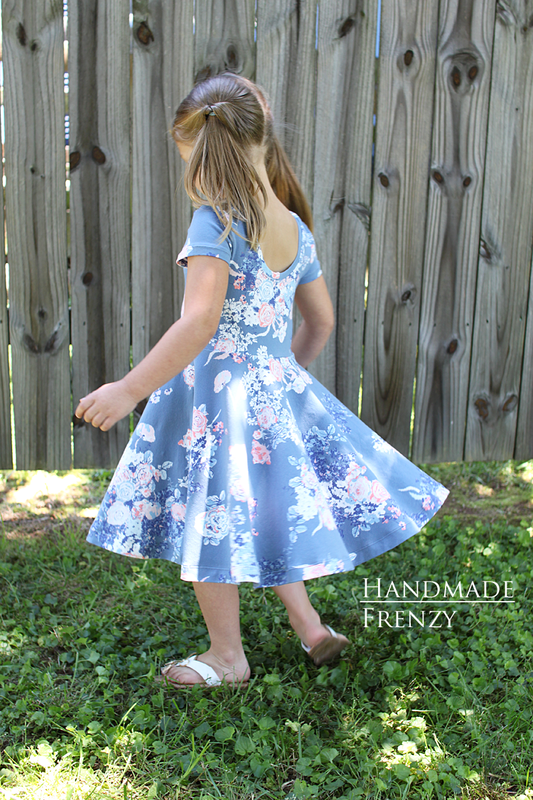 I love that it is denim, so using it for a dress, means it has some structure and is completely opaque, but still lightweight and breathable and has great drape. 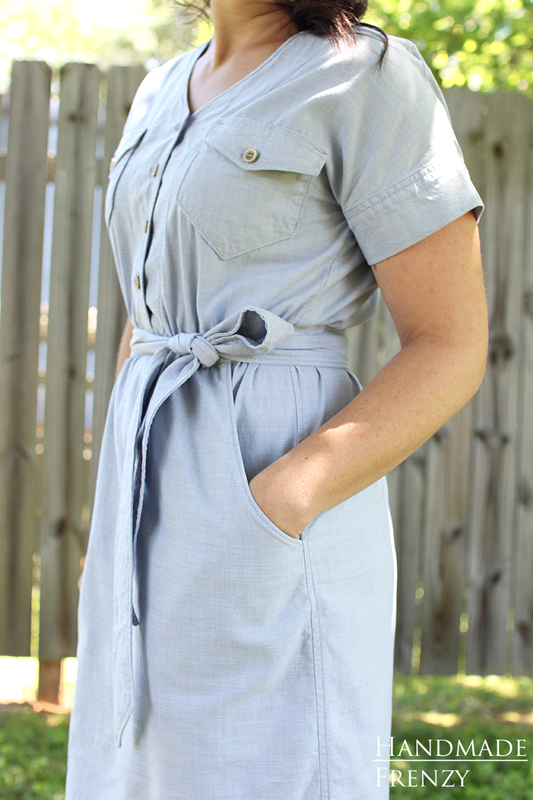 I was after a chambray shirt-dress look with this project and chose to use denim topstitching thread on most of the seams. The fabric held up perfectly to this. I also wanted a bit of the "crinkly" look that denim develops over time at the seams, so I threw the newly finished dress back into the wash and let it hang out in the dryer for a few minutes as well. 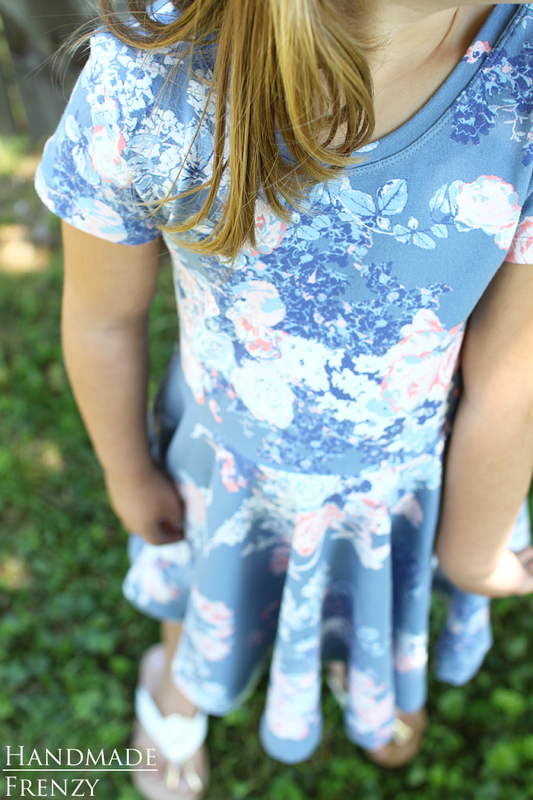 The fabric still looks completely brand new, but the dress has a little bit of that texture at the seams that I love. Also, I wanted to mention, I used the "wrong" side of the fabric for a lighter look. I love that I had a choice, which was an unexpected bonus when the fabric arrived! So in these photos it may look lighter than the swatch online, and that is why. 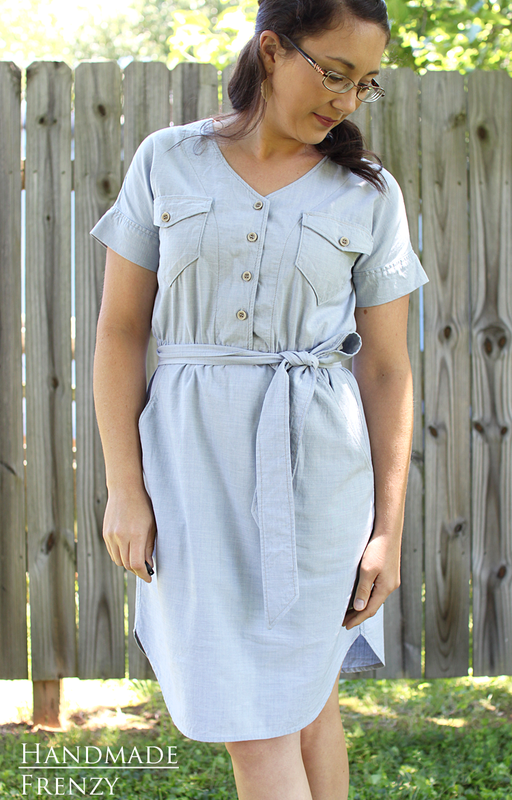 I absolutely love my new denim shirt dress!! 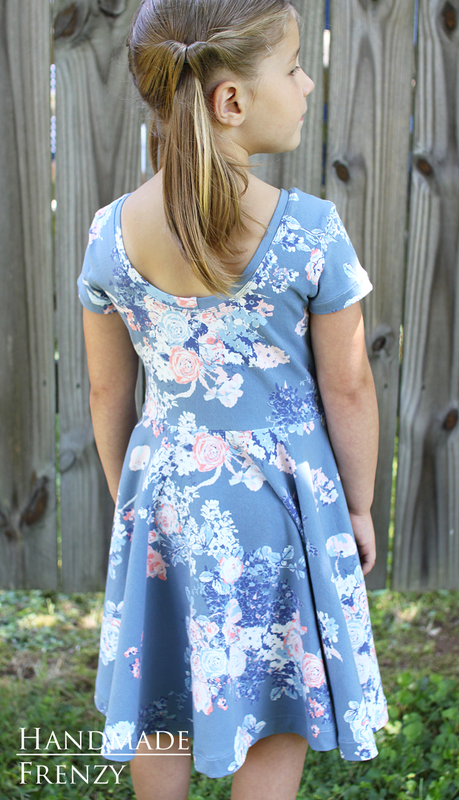 I used the Anza Dress pattern by Itch-to-Stitch, (Affiliate links) with a couple of slight modifications to lend a little bit more "shirt-dress" to the pattern. I changed the shape of the pockets, and made a separate sash to tie at the waist. I also used the denim top-stitching thread and top-stitched in a couple more places than what the pattern calls for. When sewing for my kids, my first choice is always Art Gallery Knits. When they are so buttery soft, and hold up so well, why wouldn't I??? My kids love to live in soft comfy clothes too, so it's a win-win. These knits also sew up like a dream. My serger and double needle are huge fans of this fabric. The stretch and recovery also make it so comfy and easy to wear. This fabric is quite stretchy, yet has nice weight to it that keeps it stable. It has good recovery as well, so this makes it an excellent choice for a sewist who is just beginning to work with knits. But those with experience will love it as well for the ease of sewing and the BEAUTIFUL outcome every time. There are several ADORABLE prints to choose from in the knit section of this collection. But I was most drawn to this amazing floral print. It's something I would wear myself, but isn't too grown up for my little girl either. She oohed and aahed over it when it came and I told her it was for her. 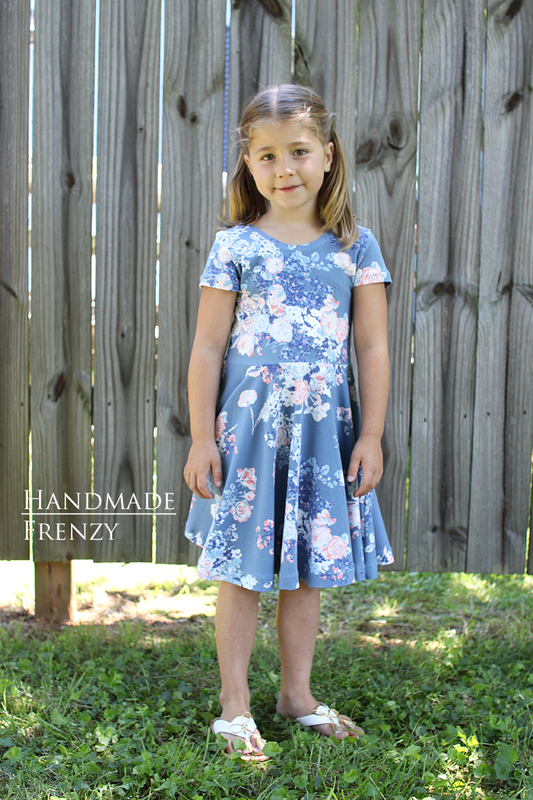 I used the Janie Dress pattern by Mouse House Creations for this dress. (Affiliate links) I love the simplicity of the design and how it allows a gorgeous fabric like this to shine. I made no modifications to it at all, other then blending two sizes for a custom fit. It is all the heart eyes from both of us for this dress! 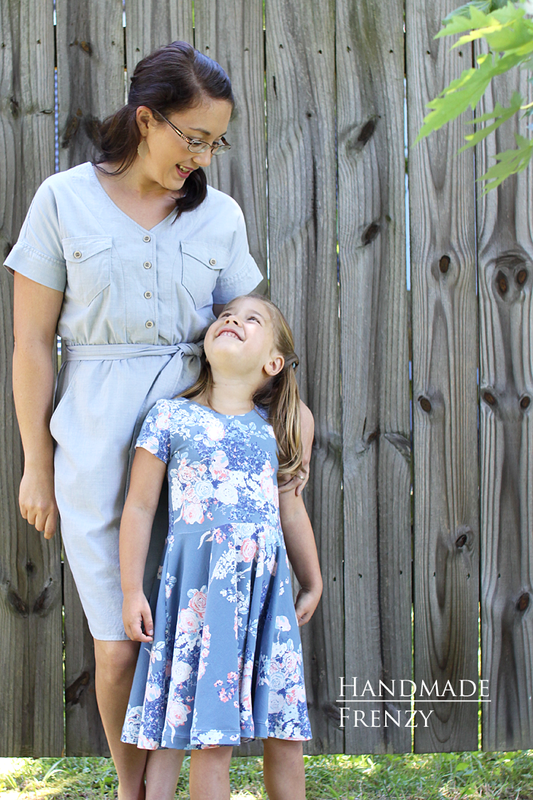 We love our coordinating Mommy and Me dresses! Thanks for the amazing fabric, Art Gallery! I love both of these looks so much!!!!!! I absolutely love the denim dress. I've never gotten my hands on any of the AG denim, but I've only heard great reviews. I love that you used the wrong side of the fabric too! That's definitely a great feature to be able to use both sides of a fabric! And I'm always impressed with someone who can make themselves a dress that looks that great! Both dresses are gorgeous! I agree, their fabrics are really great! 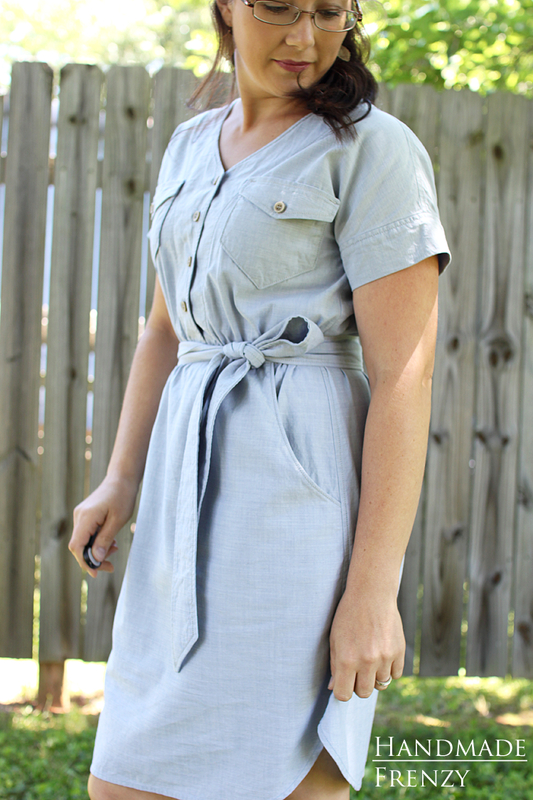 You look really really amazing in that shirtdress. Wow!